Sandy beaches, lovely boat trips, a wonderful sunrise, the best cocktail bars, great service and even a volcano trip to Nisyros. Last summer Ben and I were traveling the Dodecanese islands. A perfect island group for some Greek Island hopping. 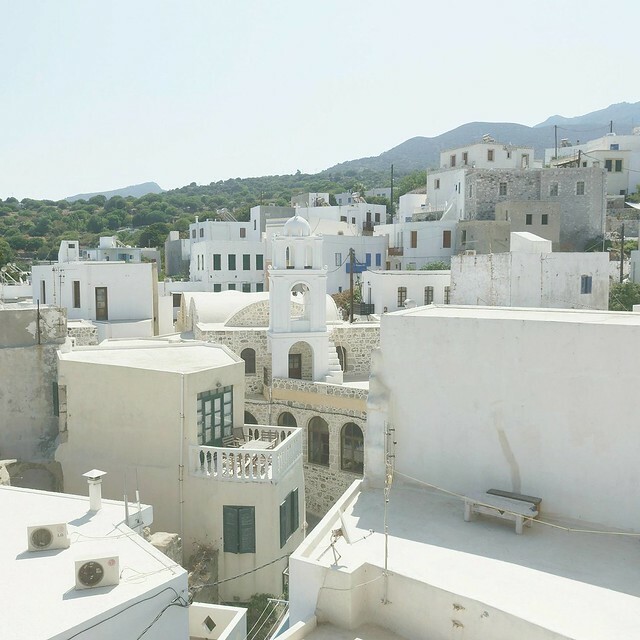 The Dodecanese islands offers you so much to do that it might be a bit overwhelming and exhausting. For this reason, Kos is the perfect island for an in-between stop. Also because of its location in the middle of the Dodecanese. In this blog I describe some activities Ben and I did during our stay on Kos. When you scroll down to the end of the page you may find the gallery I made about this trip. On my first day on Kos I started with a morning run. Kos is a great place for some sportive activities like running and biking. Mainly because of its flat area. Nevertheless, if you think about some activities like this I would highly recommend you to do this in the morning during sunrise. Each island on the Dodecanese has its own unique sunrise and sunset. And the flat area, sandy beaches hilly nature and view on the nearby islands are what making the sunrise in Kos so unique. Although Kos is mainly popular because of the relaxing beaches, Exploring the city of Kos can be quite relaxing to. The city isn’t big at all, and despite the fact that an earthquake destroyed huge parts of the city in 1933, you will still find some historical buildings. I was a bit disappointed that the earthquake last summer destroyed even more of the historical parts left. In the city centre of Kos you will find the Hippocrates tree. According to the legends, Hippocrates was teaching about Medicines on this place and Paul was teaching the gospel underneath this tree. However, the real age of the tree is untraceable since the tree became hollowed out. The Gazi Hassan Mosque is located on the same square, but sadly, huge parts are destroyed during the recent earthquake. After a few minutes walking you will arrive at Platia Agias Paraskevis, where the cathedral church of Kos stands on a terrace above the town’s square. The Agia Paraskevi is built in around 1932 but traces of earthquakes are visible. The cities market hall is located on the same square. I personally loved this place. It’s build by the Italians and however it’s a pretty small market hall, you will find a lot of fresh fruits, lovely spices and crafty traditional foods. Some traces of the Ottoman empire when you look at the Defterdar Mosque. My biggest surprise was the Casa Romana, a Roman vila. The Roman house was excavated in 1933 by the Italian archaeologist L. Laurenzi and restored in 1940. The villa has an unusually large size and according to the rich decorations it probably belonged to a wealth Koan official. I personally loved the architecture as you could see they were really trying to imitate Greek styles. I was also impressed by the beautiful mosaics and interesting history. Furthermore we had a look on the Alexander Altar, which you can find everywhere in the country. Although this one is unique, as it shows you Alexander the warrior, who slaughtered many people, but with a quote of an extract form one of his most famous speeches where is calling people to eternal peace and equality. Tracing the best beaches by bike. As I have already mentioned, thanks to the flat area, Kos is a great island to explore by bike. Since the Island is pretty windy during summer, it is important to protect your skin with some sunscreen. However, the view during our tour by bike was amazing. We saw sandy beaches everywhere. There are many organised beaches close to the small towns on the island of Kos. And although it is easy to find organised beaches at Kos town, the beaches at other parts of the islands are less crowded, which I personally prefer. Ben and I choose to take some food with is so we could have a Picnic at one of the unpaid beaches. Our main destination was Flamingo beach, located close to the small town Tigaki where we enjoyed a nice orange juice. Close to this town are also the Aliki Salt Pans that by now enjoys environmental protection. During winter you will find a lot of water birds like flamingos. Unfortunately we did not had the pleasure to meet this beautiful creatures. Nevertheless the nature here is amazing! The place is quite and not crowded at all, and you we were surrounded by the beauty of nature all around us. We were standing in a heath like and sandy area close to the sea. On the island in front of us was placed a huge Greek flag to clarify: this is Greece! On our other side we were looking up to the mountains in the middle of Kos. On the website of Greeka, you can find a clear overview of all beaches Kos has to offer. Kos is one the best places if you are looking for a place to relax. Not only because of the beaches and lovely weather, it is the best island to treat yourself with some good food, lovely cocktails an nice drinks. The coastline of the city of Kos is filled with restaurants, but also the city centre offers some great places to relax and enjoy some good food or nice drinks. One of the best things about these places is the service. Since Greek people might be a bit slow, they do know how to make profit of tourism. The waiters are doing everything they can to make sure you can sit down, relax and enjoy your food and drinks. Ben and I are not pretty good in relaxing all day long and after one day of taking our time and not doing much, we were ready to explore something new again. We booked a tour with the company “Explore Kos” to the volcano island Nisyros. We booked a full trip, so everything was arranged, a bus trip to the right harbour, the boat trip, a guided tour through the city of Mandraki and a tour to the volcano crater. The daytrip started with a tour through Mandraki. We walked through the small and traditional city to the castle of Spiliani from where we had an amazing view on the city and the islands nearby. Visiting the church of the castle was a great experience and it’s famous for the miraculous icon that is located in its church. Mandraki is a typical Greek city and I love walking through the small street surrounded with cute houses and photogenic ports and doors. Getting lost in those streets is one of my favourites things to do. These typical Greeks cities are always surprising me with their treasures hidden in those streets. Greece counts nine active and extinct volcanoes. The most famous one is Santorini, which I have been to before. I am always very impressed by these kind of creations of nature. For this reason I couldn’t wait to explore the volcano of Nisyros. During our trip the tourist guide explained us that the latest eruption of the volcano was a steam explosion in 1888. Still earthquakes caused by the volcano are not infrequent. The way to the crater is pretty interesting, firstly because of the many interesting things the tourist guide told us, but also the nature on the island is stunning! Especially when we arrived on top of the caldera we had an amazing view on the rest of the island, the surrounding island and on the impressive crater. Ben and I stayed on Kos for 2,5 days which was enough for us. When you are looking for a relaxing vacation and you are not planning to do much, Kos is amazing and you may stay a few days longer. But also when you are Island hopping through the Dodecanese Kos is an amazing place to take some rest and explore it’s unique nature.